In this chord melody lesson for guitar , Martin Taylor teaches you how to add melody to 10th intervals played on the 5th string. We learnt the G Major scale on the sixth string in the previous lesson, so it shouldn’t be too difficult to use your ears to translate the melodies and concepts across a string. The following examples show how to play the first few ideas in this chapter with the root played on the fifth string. Work through the above examples and spend time experimenting with rhythm and melody. Remember to try your melodic ideas over simple chord sequences or using intervallic jumps in the bass part. When you have these ideas mastered on the fifth string, go back to the previous lesson and see how many ways you can find to transition between 10ths on the 6th string and 10ths on the 5th string. 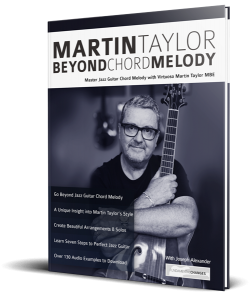 This lesson is a sample of my best-selling book, Martin Taylor, Beyond Chord Melody. It’s available now on Amazon.